Lars! totally agree with you on this one. People, even with a background in Economics, can’t seem to distinguish between a general rise in price level, and what it entails for the economy as a whole. Since this post is about inflation, it reminds me of an episode of Milton’s TV programm ‘Free to Choose'(i beleive that was the name). In one of the episodes, which pertained to inflation, i was struck by one of Milton’s statement, which basically said that inflation pits one group of the society against the other. The reason is simple: many people may be hurt by rising prices, but there are people who benefit from it too. Many people dont seem to get it, and treat everybody with the same scale when it comes to inflation. Your post is a timely reminder that, first of all, we need to know what kind of inflation are we talking about? what exactly are the reasons for it? what’s the measurement methodology, and what’s its effect on various groups in the society? Harking everybody with the same stick (CPI) just doesn’t make sense. And this goes on right before our eyes, despite the fact that CPI, as a measure of rising price elevls, has some serious shortcomings. For example, it doesn’t account for qualitative improvements, or bundled goods. Hope that common sense prevails among the populace, and policymakers recognize the distinction between various forms of inflation. Shahid, thanks for the feed. Yes, it is incredible how few economists recognise the difference between different types of inflation. This is especially important in the present situation. Furthermore, in the case of Emerging Markets like the difference between different measures of inflation can be enormous. Take an export oriented economy like the Chinese. While consumer price inflation remain fairly elevated export prices are indeed falling. So do we have deflation or inflation in China at the moment? In addition it should be noted that Emerging Markets or developing markets where the standard of living is low food prices is likely to dominate the consumer price index. If a central bank in such a country targets CPI inflation it is likely to react to supply shocks like swings in agriculture output. Effectively in such a world the central bank will be battling the climate. Obviously that is not a good policy. Therefore, nominal GDP level targeting makes a lot more sense (also) for Emerging Markets. Alternatively I have recommend a policy of targeting the export price in line with Jeffrey Frankel’s PEP proposal. I totally agree! CPI is a very bad measure of the purchasing power of a currency, and even worse in a small open economy. GDP delator would be better, and it would reduce the degree of activism of central bankers during business expansions. 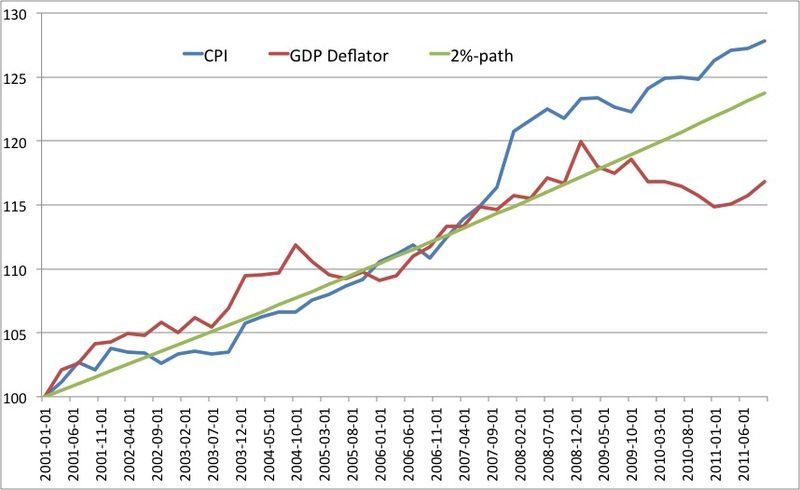 Anyhow, I do not think inflation stabilisation is the best criterion to conduct monetary policy. Thanks for these posts. I’m just a student and we briefly skimmed over NGDP targeting in my monetary economics class. Could you please explain how the GDP Deflator is measured in practice? Benjamin, it is basically a by-product of the national accounts process. The statistical authority (in Australia, the ABS) receives money and volume measures which it puts together to form estimates of NGDP and RGDP. The GDP deflator is how the statstical authority moves from monetary to “real” aggregates, using its volume measures to estimate the deflator. One thing about Czechs that makes them more relatively more worried about “inflation” than others is that they are a nation of savers, or creditors. If they were a nation with larger external financing of their debts like the US they would be less worried. Inflation is the debtors’ friend. James, I actually think that has very little to do with the actual policies of the Czech central bank. I believe the problem primarily is analytical – the CNB simply thinks that Czech monetary policy is easy because interest rates are low. I’m not an economist so I’m a little confused by this argument. Even though foreign goods are produced abroad, they are sold in the domestic currency. If the central bank expands the money supply the exchange rate adjusts to increase the price of imports in terms of the domestic currency. So why can’t central banks control import prices?